Its Fixed and working like it should Green Light and Rumble on the right side =). Thanks for adding the option to revert rumbles. 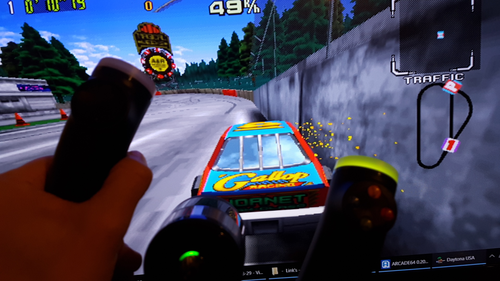 Hi Boomz, i have recently ugraded to Fanatec CSW2.5, even though i put in new GUID in Sega rally 3 ffb ini file I dont get any rumble or force feedback. Worked with my older Logitec Force Feedback Pro wheel. What I do get in the log is two of the same GUID's but I guess it will because Fanatec creates two entries inside the windows joystick device panel. I do however get the hook beep and it shows Fanatec CSW 2.5 if i switch on the show device when loading the game, but no force feedback. Also tried older versions of your plugin. Is there any a particular reason you want 0.2? You installed proper fanatec driver etc? Got it working with x360ce, but ffb not so good as before with older logitech wheel on directinput. Xinput produce more rumble vibration than ffb feel. Will try setting up a new single directinput device with vjoy and let you know. Attahed the new log file. What about toggle option to join multiple same GUID (if found) based on GUID, sending ffb to all devices based on the same GUID and not only to the fist/last one found? I guess how Fanatec setup their CSW 2.5 is one entry for the base and one for the steering hub. Ok dont worry about it for now, i will uninstall fanatec drivers and reinstall to see if only one device can show, or disable one of the two devices in device manager and see what happens. Will revert bit later. Not sure why the latest plugin not working but will try again. Just wanna do some laps right now. Now also working with your latest version. Sorry for all the trouble and worry caused, but good to know should other Fanatec owners experience same issue. Boomslangz -- thanks again for all of your work on this, the FFB plug in is really great. One question that I had was whether you intended to do a new release compatible with MAME 0.206 instead of the current version for 0.199, now that Rush 2049 will be fully playable with complete sound in MAME 0.206? I know you don't want to be forever chasing the latest version of MAME, but it's a substantial improvement for Rush 2049. And, selfishly, that's the game that motivated me to start playing around with this plug in to begin with! Have you tried for lgi? Thanks for the update!!! love rush 2049. Hey Boomz, the only two Teknoparrot racing games I can't get FFB to work are Outrun 2SP and Daytona USA. With Outrun if I copy the opengl32.dll as per your instructions to Teknoparrot folder, the game don't launch exiting immediately to desktop, remove the file and the game plays again but without FFB. Any ideas? Can you please updated the FFB Plugin to work with the new GRID out on Teknoparrot please ? Don't stress Boomz, got both working by deleting both Teknoparrot and the game folders and started setup from scratch, wonder if Windows 10 don't screw up dll files with defender, on 1803 however. Awesome, been waiting for this. Works great with the G920 wheel. A few steps to get it working with the g920. First if your using teknoparrot don't enable force feedback in the options. Then in the ffbplugin.ini for each game you need to have your guid for the G920. Open game and close it real quick then go to log.txt. The logitech g920 guid should be in there. Copy and paste the # then put it in the deviceguid= of each games ffb.ini. well i am not able to make the ffb works with daytona usa championship. I deactivated ffb under teknotparrot in order the use the plugin. I wrote the guid in the ini. Are you using original exe? Boomslangz would like you to see into GRID arcade game FFB! Also i hope that in near future you can get the impulse triggers to work for the xbox one controllers via your plugin.